There are millions of different followers of gurus, the vast majority of whom are purveying dogmas, baseless beliefs and speculative teachings. That is, when they are not also exercising autocratic power over their following and in many cases, engaging in sexual abuse of one or both sexes and yet worse crimes. India is a centre for all this kind of activity. Now one of the (previously) most well-known and respected of all Buddhist ‘teachers’ (read ‘gurus’) Sogyal Rinpoche, who is accredited and supported by the Dalai Lama has been exposed as a sexual abuser who has violently raged and assaulted his followers, as ”The Telegraph’ reports on a catalogue of damning accusations against him. He has 100 centres in 40 countries around the world where he purveys his “crazy wisdom”. He is author of The Tibetan Book of Living and Dying – another version of these bogus Tibetan doctrines which has been falsely identified as being of Buddhist origin, while it is provenly not the case (see the ground-breaking and brilliant comprehensive study of the Tibet mythology by Donald S. Lopez (University of Michigan) ‘Prisoners of Shangri-La – Tibetan Buddhism and the West‘). He follows in the ‘crazy guru’ footsteps of Trungpa Rinpoche, another sexual abuser and alcoholic with a large and distinguished following, especially in the USA, who died of AIDS. Such infantile trivia is pitiful. Does Sai Surya really think that people are going to sit for ONE LONG HOUR just chanting Loka Samastha? Even ardent devotees don’t have the time for that! ‘Two are one, not two’? In his campaign to accumulate ill-gotten gains, the instigator of the Sukshma Baba ‘oracle’ fraud, Narasimha Murthy, produces more meaningless drivel as is his wont. The absurdity of arcane numerology is called up: ‘Two is not two, but one’. This is a tricky math which flouts all reason and common sense hoping to convert the truth into its opposite and contradiction. N. Murthy has always claimed that the oracle boy Madhusudan is not a medium, now he repeats that he is not a communicator (of Sathya Sai Baba’s discourses) but “a vehicle”. This crafty play on words means nothing, as it tries to muddy the meanings of both words by conflating them. He cannot explain in any intelligible way what the difference really is. He tries to reinforce his claim that the dead Sathya Sai Baba is present (when Madhusudan goes around imitating the former false ‘avatar’) and that “sometimes Madhusudan is not there at all! This DESPITE Madhusudan all the time walking about, talking and delivering blessings and boons to the deluded ‘followers’! Instead, Sathya enters the personality of Madhusudan and the actual Madhusudan is not there. Is what undeniably remains a walking talking zombie de-personalised body? Or is it morbid possession? No, he claims is really nothing but ‘love’ and is can only be ‘seen’ with the heart (whatever the senses show). This doublethink, double talk, is just another standard trick of gurus when they are caught out in lies and ulterior motives. Beware! to Swami with hearts of pure love.” But at a tender age, children can be induced to believe anything they are told. … which is no better than “Because you can’t see Superman or Elvis, it does not mean he is not there”. As to this love, it is the kind gurus and devotees talk about endlessly but somehow cannot be observed or met in most Indian ashrams, only imagined, while in its place the money rolls in from well-heeled credulous people and exotically mind-boggled foreigners. This overlooks the fact that Sathya Sai Baba himself was an imposter who pretended to be the reincarnation of Shirdi Sai Baba and many another famous figure from Indian history and mythology, including Rama, Krishna, Vishnu and other avatars! Sathya Sai Baba was just a better actor than Madhu Sudan, but his lingam productions were undoubtedly no more genuine and followed the method of Houdini. When he no longer could manage to swallow the golden lingam before the time he should bring it forth, he reverted to sheer sleight-of-hand, using a handkerchief to cover his mouth before he opened it and let it fall out. The BBC filmed this event when making their film ‘The Secret Swami’ (where his failure was revealed) and he pretended the effort had made him ill, collapsed and went of stage without the lingam appearing. Later he returned holding the lingam, which the crowd was told he had brought forth in the usual manner. Thus hopelessly lost in religious fevered imaginings is the Indian guru follower. Indian Jet Airways issued an airline ticket in the name of Bhagawan Sri Sathya Sai Baba to the subtle form. Does this signify that oracle boy doesn’t have Sai Baba subtly inside himself, but that he has rather decided to take over the full identity of the dead avatar? Of course, he still looks exactly like the ex-student who was a Sai Baba bedfellow. Could it possibly be that this Muddenahalli business, despite its financial successes and excessive claims, is merely a deceit, fraud, a scam? (offstage: ‘subtle’ laughter from hundreds of the remaining Prashanthi devotees of Sathya SB). Some photos of the big crowds in Fiji (not?). One wonders how many will come to the “ashram” which they are starting to build? 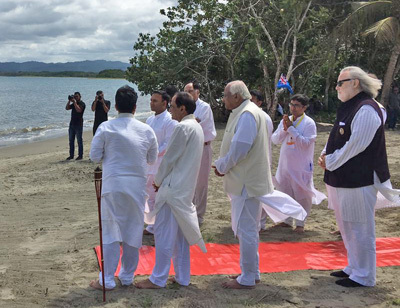 When less than 50 people come to the Fiji events with “subtle sb” in person, it seems like the “ashram” will be a ghost town from the word go. Wonder what will entirely fade away first: the Parthi or Muddy believers. It’s a race to the finishing line in the hard-to-like stakes. 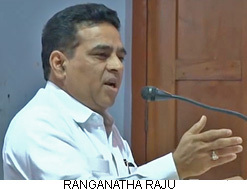 The smart money to lose would be on Madhu Sudan – this former unpopular and remorseless student now referred to as ‘Bhagawan’! One may think the Muddenahalli thing is “big” but though the attention-hungry trio and their minders wander the world, hardly anyone attends the events. It seems to consist of only a handful of rich people, perhaps only one or two in each country that the Muddy group is invited to go. 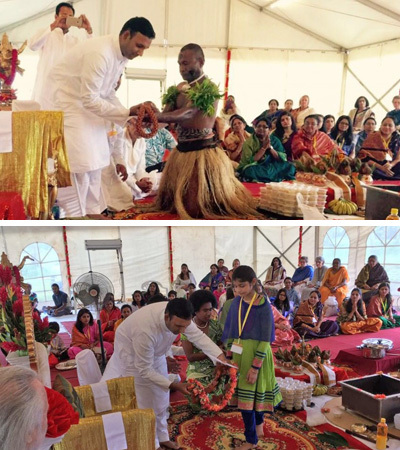 Just before the Yagna began, Swami was ceremoniously honored by the Fijians with the highest of honors possible, which is offered to the High Chief of their tribes, considered equivalent to Gods. Just as this ceremony was going on, Brother Madhusudan explained the vision that he saw. Two divine beings, a male and a female, emerged from thin air and offered their Pranams to Swami. Both seemed to have the upper body like a human, but the lower half was like that of a fish. They were the Sea God and Goddess who rule the land of Fiji from the seas. No wonder they came to honour the Lord of Lords who graced their Land! How many is too many for them, we wonder. What ‘not too many’ really says is there were fewish, fewer than expected, far fewer than prayed and hoped for. This refers to Madhu Sudan, the former student and intimate friend of Sathya Sai Baba, who claims to be endowed with the subtle form of Sathya Sai Baba. So it is natural to wonder if these 5 years will be five calendar years, five lunar years or whichever other mystical-esoterical perhaps means of reckoning will roughly correspond to five calendar years! No doubt they are already planning what to say and do after that. Subtle Baba not so subtle after all, but substantial? Does Sathya Sai Baba need a ‘communicator’? “Our little group here in Vancouver, WA, USA wanted to be connected to the A.R.M.Y in a meaningful way. Swami inspired us—- In Swami‘s room, I set up Shrines for Shiva, the Lingam and the three Goddesses Durga, Lakshmi and Saraswathi and decorated them.” “Our little group here in Vancouver,WA, USA wanted to be connected to the A.R.M.Y in a meaningful way. Swami inspired us In Swami‘s room, I set up Shrines for Shiva, the Lingam and the three Goddesses Durga, Lakshmi and Saraswathi and decorated them.